I am just about to go and charge up my Cash Passport card before I go away for a week to Val Thorens. Backpacking last year I spent about €30-50 a day including my hostel accommodation in France. However for this trip I have already paid for my accommodation, ski pass, equipment etc. So I do not need to factor this in but since Val Thorens is quite a popular place with restaurants and bars being quite expensive what would you say a daily rate to have meals etc would be? Are there any other locations that are suitable comparisons that you could give me an estimate for a week? Other factors: I do not drink or smoke. You probably have been there already and should give some feedback. I provide here some background for later reference. I do not know specifically about Val Thorens but I can give an overview of budget for skiing in the French Alps, I think it could apply to any resort there. First, ski pass, accommodation, equipment renting are the biggest budgets. A ski pass is usually around 200 euros a week. Housing varies but it is not so cheap. I would say renting equipment is around 10-15 euros per day. For everyday budget, I consider you have access to a minimal kitchen where you stay. If you want to reduce your budget, make your own sandwiches and cook in the evening. In a restaurant or sandwich stall a sandwich would cost probably around 7-8 euros and a main course would be around 10-15 euros, add almost 5 euros if you want a drink with it. For those hanging out, expect beers/drinks to be expensive too. I think you should expect 5 euros for a bottle, probably 7-8 at least for a pint in a bar. Overall, the basic tricks are to buy food in the valley (Chambéry for Val Tho), especially if you have a car and then cook/prepare sandwiches for most days. But anyway, going skiing is quite expensive so be prepared to spend some money. Apologies for taking so long to respond back, been busy at work. Note this does not include rentals, flights and accommodation which I already paid for at an earlier stage. Next morning: food supplies 25 euros for bread, cereal, milk, meats, cheeses, cans of coke, chocolate and coffee. From then I decided to make my own lunches and some evenings go to restaurant. 7 euros everyday for croissants, baguettes and some meat. Restaurants about 25-40 euros a night depending on how much you want to eat and if it's something nice. There is free bus and shuttles in the area so you don't need to pay for transport unless you go outside the valley. All in all to factor it in: approximately 200 euros give or take a few for small things like post cards. However if you really wanted to splurge you could easily spend over 500 euros there. WARNING! Most clubs dont give free water, expect to pay around 3 euros for small bottle! Val Thorens operates a "Happy Hour" policy in most bars and clubs. and if you went with a tour operator like I did (Wasteland Ski) you get given a wristband that gives you around 10-15% discount on drinks. 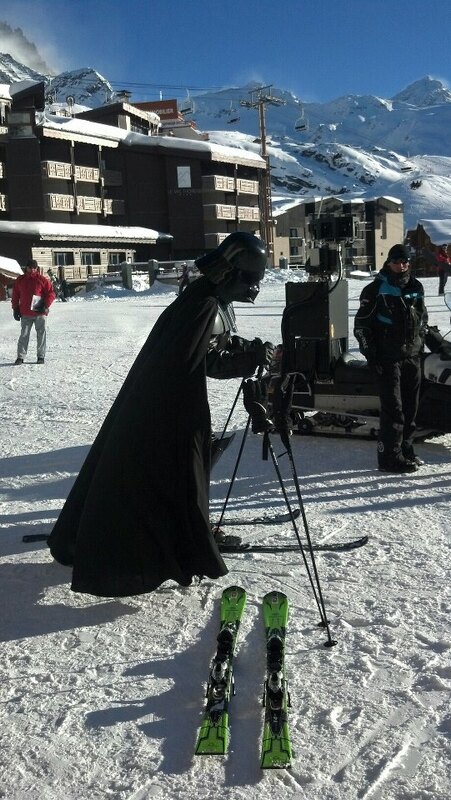 So I leave you with this information but before I go here is a picture of Darth Vader who I met on the Ski slopes! Not the answer you're looking for? Browse other questions tagged budget france skiing alps or ask your own question. Can tourists go skiing in Yemen?